Complete protein blend (organic sprouted whole grain brown rice protein, pea protein), organic brown rice syrup, Organic cane Sugar, organic tapioca syrup, Palm kernel oil, brown rice crisps (whole grain brown rice flour, calcium carbonate), organic dates, organic cashews, cocoa powder (processed with alkali), organic agave syrup, Vega blend (vitamins & minerals: potassium phosphate, calcium phosphate, magnesium oxide, ferric pyrophosphate, calcium ascorbate, zinc citrate, potassium iodide, molybdenum citrate, vitamin A palminate, niacin, vitamin E, copper citrate, selenium citrate, manganese citrate, biotin, calcium pantothenate, thiamine HCL, riboflavin, vitamin B6, vitamin B12, chromium citrate, vitamin D2, folate, GREENS: alfalfa grass, spinach, broccoli, kale, BERRIES: extracts of grape seed, maqui berry, goji juice, açai berry, pomegranate seed, mangosteen, PROBIOTICS: L.Acidophilus LA-14, B.Bifidum BB-06)), dried coconut, Vega SaviSeedTM (Sacha inchi) Oil, unsweetened chocolate, Buckwheat, Inulin (from chicory root), Contains 2 percent or less of:, chia seeds, Hemp seeds, organic vanilla extract, natural coconut flavor, natural vanilla flavor, Sea salt, Sunflower Lecithin. Contains tree nuts. May contain traces of milk, peanuts, sesame, and soy. May also contain fruit pits or nut shell pieces. Keep in a cool dry place away from direct light. Complete Protein Blend (Organic Sprouted Whole Grain Brown Rice Protein, Pea Protein), Organic Brown Brown Rice Syrup, Organic Tapioca Syrup, Chocolate Liquor, Organic Cane Sugar, Brown Rice Crisps, Organic Dates, Organic Cashews, Cocoa Butter, Organic Agave Syrup, Vega Blend (Vitamins & Minerals: Potassium Phosphate, Calcium Phosphate, Magnesium, Iron, Vitamin C, Zinc, Iodine, Molybdenum, Vitamin A, Niacin, Vitamin E, Copper, Selenium, Manganese, Biotin, Calcium Pantothenate, Thiamine, Riboflavin, Vitamin B6, Vitamin B12, Chromium, Vitamin D2, Folate, Greens: Alfalfa Grass, Spinach, Broccoli, Kale, Berries: Extracts of Grape Seed, Maqui Berry, Goji Juice, Acai Berry, Pomegranate Seed, Mangosteen, Probiotics: L. Acidophilus LA-14, B. Bifidum BB-06), Dried Coconut, Vega Saviseed (Sacha Inchi) Oil, Buckwheat, Inulin (from Chicory Root), Cocoa Powder, Natural Coconut Flaovr, Chia Seeds, Hemp Seeds, Sunflower Lecithin, Organic Vanilla Extract, Sea Salt. Complete Protein Blend (Organic Sprouted Whole Grain Brown Rice Protein, Pea Protein), Organic Brown Brown Rice Syrup, Chocolate Liquor, Organic Tapioca Syrup, Organic Cane Sugar, Organic Peanut Butter, Organic Date Paste, Cocoa Butter, Brown Rice Crisps, Organic Agave Syrup, Organic Peanuts, Vega Blend (Vitamins & Minerals: Potassium Phosphate, Calcium Phosphate, Magnesium, Iron, Vitamin C, Zinc, Iodine, Molybdenum, Vitamin A, Niacin, Vitamin E, Copper, Selenium, Manganese, Biotin, Calcium Pantothenate, Thiamine, Riboflavin, Vitamin B6, Vitamin B12, Chromium, Vitamin D2, Folate, Greens: Alfalfa Grass, Spinach, Broccoli, Kale, Berries: Extracts of Grape Seed, Maqui Berry, Goji Juice, Acai Berry, Pomegranate Seed, Mangosteen, Probiotics: L. Acidophilus LA-14, B. Bifidum BB-06), Vega Saviseed (Sacha Inchi) Oil, Buckwheat, Inulin (from Chicory Root), Cocoa Powder, Chia Seeds, Organic Peanut Flour, Natural Coconut Flaovr, Hemp Seeds, Organic Vanilla Extract, Sunflower Lecithin, Sea Salt, Organic Peanut Extract. 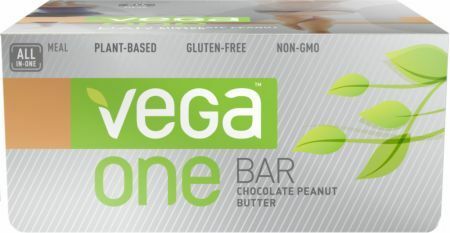 Formulated by Brendan Brazier, professional Ironman triathlete and bestselling author on plant-based nutrition, Vega One Meal Bar is gluten-free and contains no artificial flavors, colors or sweeteners.